Share Your Message and Your Brand! 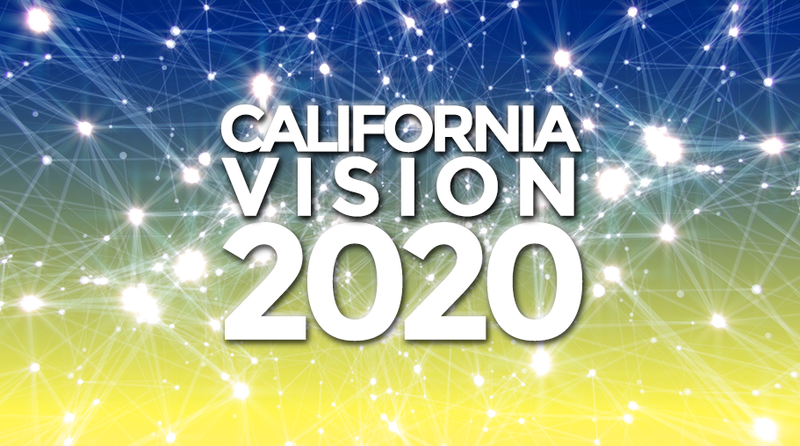 The second annual California Vision 2020 conference will bring together 400+ forward-thinking innovators and movement builders—influencers from around the state who share your values. Those who are already making a difference and those who are inspired to take action! Socially-conscious leaders, aspiring movement makers looking to amplify their work through the relationship building and connecting with new resources that this conference offers. Support the Work of Visionaries! With American politics gridlocked, our best path forward is to have California, the land of innovation and sixth largest economy in the world, lead the way...with exciting new solutions, and by growing those solutions already brewing—for everything from immigration to climate change. through our media relations and marketing campaign reaching millions through both free and paid media, email and social media campaigns. Inspire a Shift in Consciousness! With our national politics in crisis, California can lead the way in building a healthy, vibrant, inclusive society. The work and brand of The Shift Network is to wake people up, raise their awareness and incite a shift in thinking. The conference program is designed to highlight forward-thinking policy and lift the spirit over partisan divides, uncover blind spots and form new partnerships in common purpose.